Ok. Time to show my age again. Remember VHS tapes that you used to watch movies on? They went into this contraption called a VCR. And if you rented a VHS copy of a movie from your local video store, you were supposed to always be kind and rewind. But before you could rewind, on certain movies there would be something called ‘Watch & Wear‘, and if you were smart you would have had your wallet ready back then. 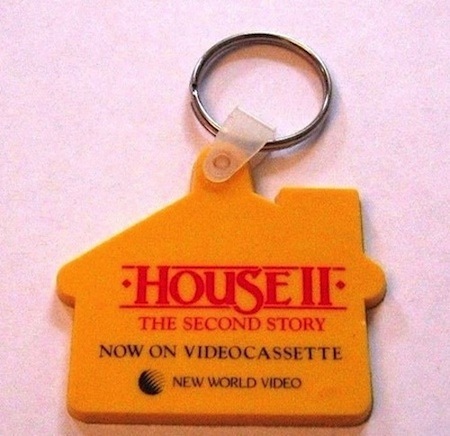 ‘Watch & Wear‘ was a special promotional addition before and after the movie that would allow you to purchase memorabilia from the movie you just watched. And the one movie that I remember most that had this option, was none other than Hellraiser! Goddammit. I knew I should I gotten that satin Hellraiser jacket when I had the chance back in 1988. Now it’s just a pipe dream. Truth be told, I would have gotten the T-shirt, jacket, coffee mug, and the gym bag for sure. And my flipper mentality knows that these would be worth a lot more than what I would have paid for them back then. Good luck trying to track down any of the items located in the ‘Watch & Wear‘ promotion, but if you do find the satin jacket – please make sure to contact me ASAP.